Hey there! Thanks for dropping by The World Through My Lens! Take a look around and grab the RSS feed to stay updated. See you around! 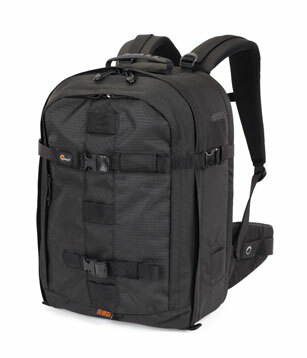 The folks at LowePro were kind enough to lend me the Pro Runner 450AW backpack to try out. The 450AW is a very functional, high capacity backpack. This bag is large and in charge! It has tons of room for all of your camera equipment and even a slot for your laptop. 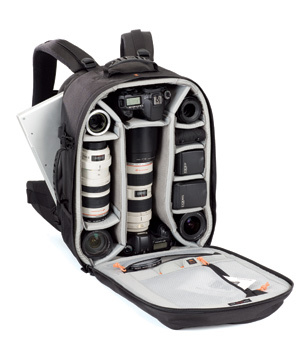 Inside the main compartment of the bag is room for two dSLRs and about 8 or 9 small lenses or 2 0r 3 large lenses. You can rearrange the dividers in a number of configurations to fit longer lenses or other gear as well. I don’t have that much equipment yet, so I used the space for chargers and other camera accessories I needed to take with me. As you can see in the picture below, there is ample storage in the three pockets shown when the main compartment is open. I used these pockets to hold extra memory cards, remotes and filters. 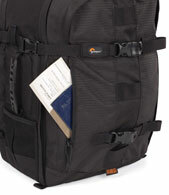 When I asked LowePro for a bag to review, I wanted one that could accommodate my laptop. I have an HP 17 inch laptop and it was a little bit of a tight squeeze, but it fit in and I was able to take it with me. I used some of the extra room inside the main compartment to store my power cord for the laptop. One of the things I really like about this bag is the amount of padding on the straps and waist belt. With the amount of equipment you can carry in this bag, the padding makes carrying it around all day much more comfortable. The padded straps definitely help distribute the weight and make it more manageable. There is also a lot of padding for your back to help absorb the weight. This bag is quite heavy when fully loaded with a laptop and all my camera gear, and I am not a little guy. I am about 5′ 7″ and about 200 pounds . The front of this bag also has a large zipped storage area that can hold quite a bit. This area has a hook to hold your keys and two pockets to hold miscellaneous items you need to store. There is a hefty strap that keeps the bag shut and gives it extra support. The straps also double as a tripod support. 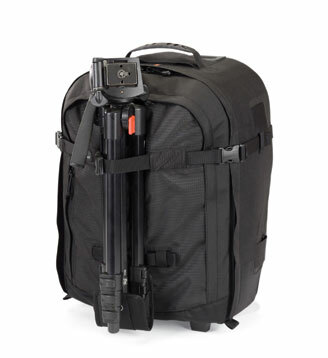 There is a movable base for the bottom of the tripod to go into that you can attach to the bottom of the bag using the two straps on the front of the bag. The backpack also comes with a built in rain cover. It is built in and stowed away in a front pocket until you need it. It is tucked neatly in the under the front storage pocket, closed in with a nice Velcro tab (not shown). Another feature I really liked was a small storage pocket on the front of the bag. You can use this pocket for storing things you need to grab in a hurry, like a plane ticket or directions. The picture below also shows one of two handy grab handles for easier pick up. Overall, I really liked this bag, but it is much larger than what I need. I don’t have enough equipment to fill it to it’s potential. 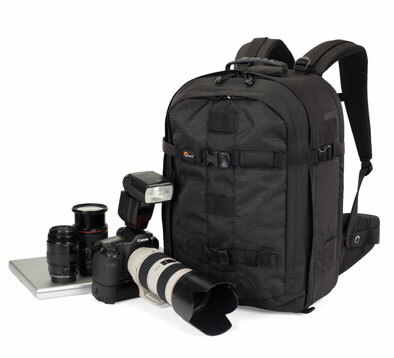 For a real serious professional with tons of gear, this is the perfect bag. I would love to try a bag that is just a touch smaller to compare it to this one. I contacted LowePro about their bags because I have a LowePro Mini Trekker that I have had for 7 or 8 years that is still in great like new condition, despite me using and abusing it almost every day for the time that I have had it. What bag do you use for your camera gear? Why do you love it/hate it? I recently bought that model back pack, and it will be my carry-on back for my upcoming trip to Europe. I also bought a Pacsafe wire netting for security. This is a relly well-designed pack, and buying it was a no-brainer. Al, glad to hear it. I really enjoyed testing it out for LowePro. With the quality of my 7 or 8 year old LowePro bag, I had no doubts that it would be a great product. Have fun on your trip. Feel free to stop back in and let us know how it went. I have a Kata R-103 back pack which holds a good deal of equipment safely with an abundance of padding and the weight is distributed well. I truly love it for those two reasons. Here is my review: http://www.moviephotoforums.com/forums/showthread.php?t=1351. I have two LP bags. WHile GREAT bags, my ONE complainr it the fact they are a bit tight with my Nikons that both have battery packs. Hey J. R.! Good to see you over here! Thanks for popping in. I don’t have the battery packs on my camera, but I could see how they would be a tight fit. Thanks for the input. I recently purchased the pro runner 350. The laptop pouch is adequate for a 17 inch monitor as long as the body thickness is slim to average. The build quality seems very good. I have used a Slingshot 100 for several years with great success. The pro runner 350 is large enough to carrry your gear to a destination and then break out the slingshot for daily shooting. I can get two bodies, four lenses, a palmcorder, chargers, extra hard drive for backup, my laptop, flash, cards, cables, batteries, filters, travel docs, etc. in the back. It is a tight fit; and, the 450 would probably work better. But, I would rather keep the overall size slightly smaller to insure that the flight attendant doesn’t eye it as candidate for going below. Thanks for the great information, Dan! I will definitely look into both of those bags.